A common need for all Rolling Ball Sculptures is a method of controlling the movement of the balls. 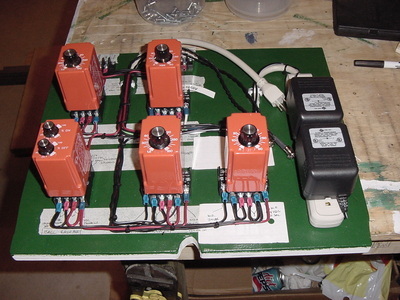 This is most often accomplished through the use of electric motors and switches. Sometimes, electronics are avoided by making the sculpture truly interactive and having the observer place the marbles at the top manually. 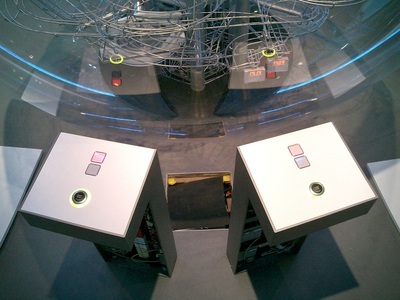 In this case, the marbles are released on-demand using levers that activate gates and release the marbles. This interactive control method can be seen in "Cascade." When I use motors to power the lifting devices in my sculptures, I strive to make the motor an integral part of the mechanics, without detracting from the aesthetics. 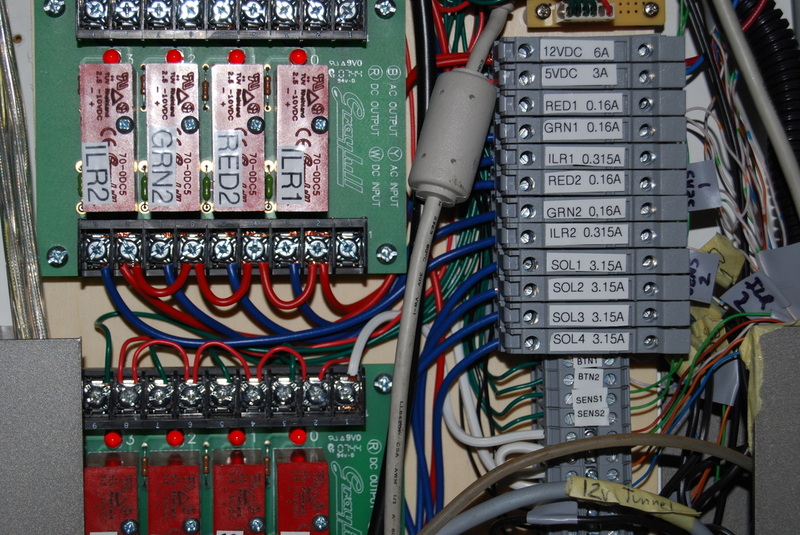 To accomplish this, all wires are hidden within the structural members or obscured from view. Any switches, relays, or timers are placed out of the view of the observer, yet in easy access to the owner. 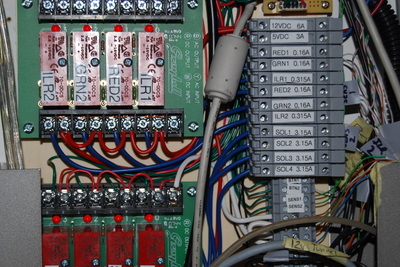 This photo shows the top of the display case where all the timers and relays are kept for the Mechanical Engineering Demonstrator. Intermittent Running: This is achieved through an intermittent switch that runs the display only when held down. 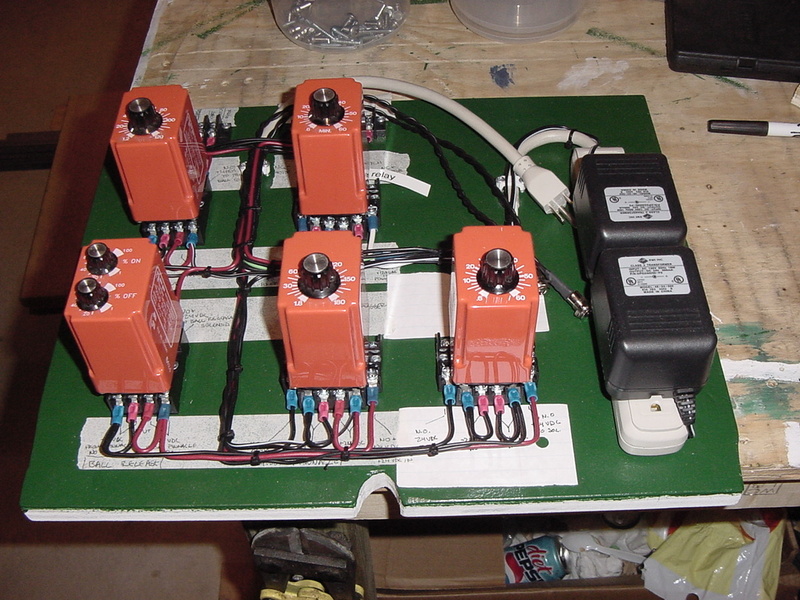 Continuous Running: Continuous running is achieved through a simple on/off switch. The display will run whenever the switch is in the on position. Timed Running: This control method uses timers and relays to control when the display turns on and for how long. This is the best control method for a display where crowds come and go at pre-determined times. Of course, all of these control methods can be combined to make a display that works on a pre-determined schedule, as well as on demand. The Type of control method you choose to employ will be determined by the habits of the viewers as well as the location.